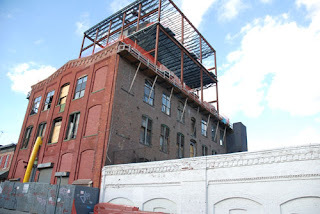 The Gowanus Lounge: Scarano Still on the Job at Carroll Gardens Hell Building? Scarano Still on the Job at Carroll Gardens Hell Building? Is architect Robert Scarano still working on a controversial Carroll Gardens building? Carroll Gardens blogger Pardon Me For Asking reported that Tom Gray from Council Member Bill De Blasio's office had told people at the Carroll Gardens Neighborhood Association Meeting on Monday that Mr. Scarano is no longer working on the project at 333 Carroll Street that has come to be known as the Carroll Gardens Hell Building. Mr. Scarano is still noted as the architect on the Dept. of Buildings website, but then, no new documents have been filed. Queens Crap points out today that there is a comment on PMFA that might have been added by Mr. Scarano, who has been known to leave commments on website posts concerning him or his work. This comment is anonymous. It says, "Of course I am still on the website as the architect, dumbass, because I am." Time will tell. Well, Scarano did change the name of his firm. Maybe the developer told Tom Gray that Scarano Architects was no longer on the project. Technically, that wouldn't be a lie since the firm is now known is Scarano and Associates. Who knows but yes, time will tell. If that was really Scarano posting on PMFA that is low and perfectly illustrates his lack of professionalism. He really needs to be stopped.